Travelling by coach is ideally suited for individuals, families and groups alike, and with services to Manchester Airport from across the UK, travelling by coach is a convenient and cost-effective option. Looking4Transfers finds you the best prices from trusted and reliable coach operators, so you can enjoy a stress-free trip to the airport. Coach services operate daily from the Manchester Airport Station, the integrated transport hub at the heart of the airport. All three airport terminals are easily accessible using the covered Skylink walkways. Services to the airport operate daily from a range of pick-up points across the UK, direct to the airport door. 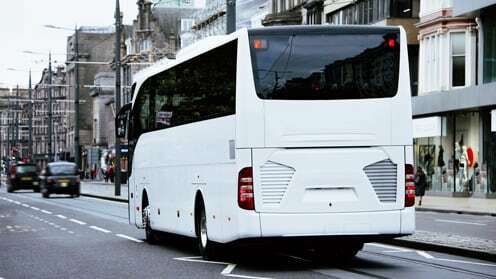 National Express - the UK's largest operator of scheduled coach services - operates direct services to and from Manchester Airport and many key destinations throughout the UK. Can I take luggage with me? What facilities do the coaches have? Most coaches have toilets onboard to make your journey as comfortable as possible. In many cases, coaches now have electrical sockets and air conditioning. Some also have free Wi-Fi onboard.